Clarins understands my life. It seems like the launch of the Clarins Multi-Active Day Early Wrinkle Correction Cream was made just for me (okay, and admittedly, for every one of my friends). It’s a day cream for the multi-active woman, aged 25-40, who endures multiple stresses a day. It's not just an intensely busy workday, happy hour with the girls and preparing dinner while checking your blackberry. It's yoga whenever you can find your mat and making the post office just before it closes. All of these stresses lead to the earliest signs of aging (Gasp! Is that a wrinkle?!) -- especially near the forehead, eyes and mouth. Clarins Multi-Active Day Early Wrinkle Correction Cream is formulated with natural, fair-trade ingredients that prevent wrinkles, increase moisture and restore elasticity and tone. It comes in four different textures to suit your specific skin type and needs, including a lotion with SPF 15. All the textures are light, airy, and beautifully scented, almost like baby powder but much more delicate and luxurious. And now, I’m here to announce possibly the best-kept secret ever: Clarins offers complimentary 20-minute facial treatments at every single counter in the nation! No appointment is necessary -- just walk up, and a specialist will thoroughly analyze your skin type and customize a facial for you right then and there. She’ll demonstrate all the Clarins secrets while removing makeup and applying eye cream, serum, neck cream, day cream, UV cream and even hand cream. A spa experience for free? Clarins really does understand me. 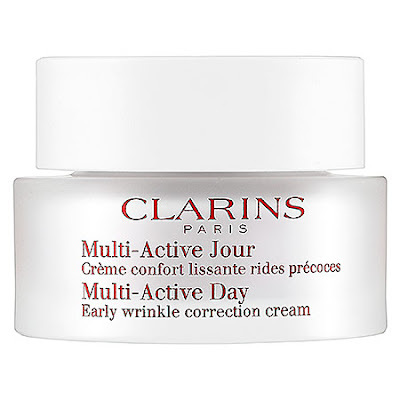 Clarins Multi-Active Day Early Wrinkle Correction Cream retails for $58 at sephora.com. Great find and great post!